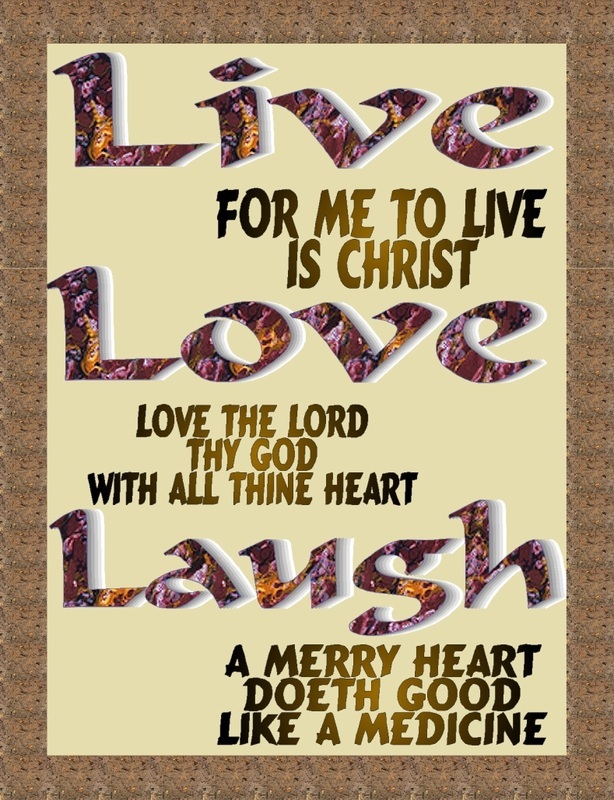 >> LIVE, LOVE, LAUGH -What Kind Of A Legacy Are You Leaving? LIVE, LOVE, LAUGH -What Kind Of A Legacy Are You Leaving? I recently attended a baby shower and was asked to do a devotional. I’ve been reading an ebook by Ken Ham and Steve Ham entitled Raising godly children in and ungodly world – Leaving a Lasting Legacy. As I was thinking about this, the words Live, Love, and Laugh that are often displayed in homes came to mind. Teach them that you must know the Savior for themselves. They are not Christians because you are. Just as the Israelites had to look at the serpent on the pole, Your children must look to Jesus as their own personal Savior. You have heard of the song LOOK and LIVE – we must all look to the Savior before we can truly live. How you live before your children will have a great influence on them – Realize that you are being watched. Provide a consistent and Godly example for them to follow-In order to live properly before our children we should be be filled with the Spirit be right with God, and be in fellowship with the Lord. We need to realize that we are being watched. We are the most important role models and examples our children will have on this earth. Every word and every action is being processed by those who are looking to us for guidance. We have the distinct privilege of actually showing our children how the truth of God’s Word is relationally affecting our lives. In short, we get to show our children a passion for Jesus in real and relational ways. Let your children see you read your Bible, Pray and Study. Teach them and show them that the things of this world are not important and will not last. Deuteronomy 6:7-9 And thou shalt teach them diligently unto thy children, and shalt talk of them when thou sittest in thine house, and when thou walkest by the way, and when thou liest down, and when thou risest up. And thou shalt bind them for a sign upon thine hand, and they shall be as frontlets between thine eyes. And thou shalt write them upon the posts of thy house, and on thy gates. I am thankful that as a child I learned Scripture from wall plaques that mom hung up such as I Peter 5:7 and Isaiah 30:15.
listening to your talk, they are judging by your actions every day. If we are living the gospel before our children, then we will show them genuine love. Jesus certainly showed the children love – he showed physical affection by taking them on his lap, he never turned them away, and as the children were on his lap, I think he listened with undivided attention. Luke 18:15-16 And they brought unto him also infants , that he would touch them: but when his disciples saw it, they rebuked them. But Jesus called them unto him, and said, Suffer little children to come unto me, and forbid them not: for of such is the kingdom of God. Acts of kindness and thoughtfulness ought to run rampant throughout the Christian home. The giving of one’s self and doing for one another ought to be the normal course of action in the Christian home. He who frequents the company of bad or corrupt men will soon be as they are. Love ought to characterize the Christian home if it is going to be a happy home. In Romans 12:10, the Bible says, .Be kindly affectioned one to another with brotherly love..
And, surely, brotherly love that exists in the house of God ought to begin in the Christian home. Enjoy Life Together. Laugh with your children, laugh at yourself, Enjoy every moment with them. Have fun as a family – do things together and go places together. Things don’t last forever, but your children do. They are the only “things” you can take to heaven with you so evangelize them so they will be ready.